[Episcopal News Service] Sewanee: The University of the South in Tennessee sits atop a plateau, and students interested in viewing the expanse of valley to the west are invited to hike some of the more than 50 miles of trails across the campus, known as the Domain. Seeing those landscapes is enough to know their beauty. “The stretch of Perimeter Trail from Morgan’s Steep to Armfield Bluff affords wonderful views to the valley and into deep coves,” one professor recommended in a 2008 Sewanee Magazine article profiling the best day hikes on Sewanee’s 13,000 acres. The names given these places, however, reflect a time when Sewanee’s early leaders openly embraced a belief in white racial superiority. Oliver Morgan was a member of one of the most prominent slaveholding families in Louisiana, and John Armfield was part owner in a leading U.S. slave-trading operation. Both men contributed to the original founding of the university by dioceses of the Episcopal Church in 1857. Church leaders across the South who supported the new university saw it as their Christian duty to help maintain the slaveholding order, according to Woody Register, a Sewanee history professor who is leading a six-year research project on Sewanee’s early ties to slavery and segregation. That vision never materialized. By the time Sewanee opened its doors in 1868, the Civil War was over and slavery had been abolished. How the University of the South recalibrated its mission in that new order is one focus of the university-sponsored Project on Slavery, Race, and Reconciliation. “I like to think of this as there being two foundings,” Vice Chancellor John McCardell Jr. told Episcopal News Service. “One, the founding that failed, and one that succeeded.” The founding that succeeded, he added, was not driven by a desire to maintain slavery. Even 150 years after that second founding, those who fought to maintain slavery are still honored at Sewanee, and such public honors, especially those bestowed on Confederate army leaders, have faced increased scrutiny at Sewanee and institutions around the United States in the aftermath of deadly violence at a white supremacist, neo-Confederate rally in Charlottesville, Virginia last summer. Those events in August sparked a national debate over Confederate imagery in public spaces. Register’s team at Sewanee, barely a month into its research, was asked to provide information supporting university administrators’ decision to relocate a prominent memorial honoring Confederate Gen. Edmund Kirby-Smith, who taught at Sewanee after the Civil War. Re-examining Confederate symbols, though numerous on campus, is not the sole focus of Sewanee’s project. The Project on Slavery, Race, and Reconciliation, part of a coalition of three dozen universities known as the Universities Studying Slavery, aims to expand the narrative of the university’s founding and its first century beyond what can be told through Sewanee’s own archival documents. Register’s team is “casting our net much more broadly” for new details of that untold story by examining records kept across the South in places where the university received its early financial support – including in some of the 28 Episcopal dioceses that still own and govern the university today. The project’s work also is integrated into Sewanee’s academic life, with several students serving on the project working group. “If we can acknowledge the past, then we can progress, so I think this is a huge step,” said Jonathan Brown, a senior who is on the project’s group. Brown, an American studies major, is black and grew up in Silver Spring, Maryland. He chose to attend Sewanee after receiving a scholarship, and he didn’t know much about the university’s history at first. In his four years there, he fell in love with Sewanee and its close-knit community while having the opportunity to learn more about its past. With the Project on Slavery, Brown has helped organize some of its public events while preparing the younger students on the team for the work they will do in years ahead. Silver Spring is a suburb of Washington, D.C., and Brown recalls conversations with his parents about the research Georgetown University was conducting on its historical complicity with slavery, including its sale in 1838 of 272 slaves to keep the university running. The Episcopal Church has taken similar steps to confront its past. Presiding Bishop Michael Curry has made racial reconciliation one of his top priorities, most notably through the “Becoming Beloved Community” initiative. And General Convention has passed numerous resolutions on the subject, including a 2006 resolution about slavery. “The Episcopal Church acknowledges its history of participation in this sin and the deep and lasting injury which the institution of slavery and its aftermath have inflicted on society and on the Church,” the resolution said, and it called on each diocese to compile evidence of that complicity. Racial reconciliation also is a goal of Sewanee’s project, as it reaches beyond the campus to foster discussion in the community about these issues. One recent example was the Feb. 19 forum titled “Reading and Rereading History” featuring two Sewanee professors discussing symbols of racial injustice on campus. The event was held off campus to encourage a mix of students and residents to participate. “I certainly think the what we’re doing here is consistent with what the church is seeking to do,” said McCardell, the vice chancellor, who is an Episcopalian. Sewanee has grappled for years with how to balance an appreciation for its history with a desire to confront and move beyond its past ties to racial oppression. A 2005 New York Times story detailed changes Sewanee was making at that time to appeal to a more geographically and racially diverse pool of potential students – changes dismissed as destructive or unnecessary by some alumni. Despite the removal of some overtly racist symbols, administrators told the Times they had no intention of getting rid of certain other landmarks that had been fixtures on the campus for decades, such as the Kirby-Smith memorial. The university’s 2012 strategic plan also emphasized a commitment to fostering a diverse campus community, and in the 2015-2016 academic year, Sewanee created several task forces of students and faculty to study ways of fulfilling that commitment. That effort came just as the national conversation around Confederate symbols had deepened after a June 2015 shooting in Charleston, South Carolina, in which a gunman with Confederate sympathies murdered nine people at Emanuel African Methodist Episcopal Church. In fall 2015, Sewanee removed a portrait of Leonidas Polk from public display. Polk was the Episcopal bishop who led the drive to create the University of the South before joining the Confederate army as a general during the Civil War. (He was killed in battle.) A portrait known as “Sword Over the Gown” shows Polk vested as a bishop but with his Confederate uniform draped over a chair and his military sword beside him. The portrait, said to be a copy of the original, was moved from Convocation Hall to Sewanee’s archives, sparking a mix of support and criticism. The following year, Sewanee joined the Universities Studying Slavery. McCardell and other top administrators asked Register in August 2016 to lead the Sewanee Project on Slavery, and over the winter, Register and a graduate student, Tanner Potts, drafted a plan for the six-year project that launched in July 2017. Register expected to spend two or three years researching the history of the campus’s tributes to Kirby-Smith and other Confederate and slaveholding figures, inviting input from all sides before recommending any changes. By fall 2017, however, the work had grown in urgency. Other Episcopal institutions, too, have fought to keep pace with current events while assessing what to do about Confederate symbols. Washington National Cathedral had embarked on what it thought would be a two-year process of discerning whether to keep or remove images of the Confederate flag in its stained-glass windows. After the violence in Charlottesville, the dean announced abruptly last fall that no further deliberation was needed, and the flags were removed. The clashes between hate groups and counterprotesters in Charlottesville centered around the city’s decision to take down a statue of Confederate Gen. Robert E. Lee. 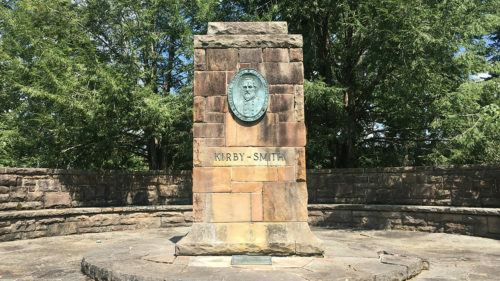 Soon after those clashes, McCardell said he was contacted by a descendant of Kirby-Smith asking that the memorial at Sewanee be moved to the campus cemetery, where it would be less likely to become a flashpoint for controversy. McCardell moved forward with that plan in the fall, after consulting with Register’s team about the history of the memorial. It had been proposed in the 1920s by the Daughters of the Confederacy, but because fundraising was difficult during the Great Depression, it wasn’t installed until 1940, Register said. 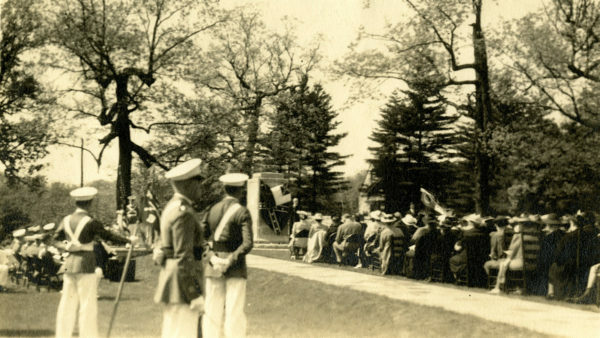 His team confirmed the memorial was on campus property, dispelling rumors that the land had been given away long ago. And research into the memorial’s dedication ceremony, which bore a military motif and featured display of the Confederate battle flag, indicated that Kirby-Smith was honored more for his Civil War record than for his later career as a math professor. The university moved the memorial to the cemetery with little fanfare. “The idea is to understand things as best we can before we act,” Register said. As Register expanded his understanding of Sewanee’s ties to slavery and segregation, he gradually worked some of those details into his teaching and scholarly articles. About three years ago, he helped produce an exhibition on Sewanee manhood called “Founded to Make Men” that foreshadowed his present work with the Project on Slavery. “It changed how I thought about the history of the university,” Register said. As examples, Register noted that some dormitories are named for Confederate military figures, such as Charles Todd Quintard, a Confederate chaplain who later became the Diocese of Tennessee’s first post-war bishop and served as Sewanee’s vice chancellor. (Quintard is celebrated by the Episcopal Church every Feb. 16.) Another dormitory is named for Josiah Gorgas, a Confederate general who later served as president of the University of Alabama. The work of the Project on Slavery has revealed how many connections to Sewanee’s antebellum roots are found scattered around the campus, sometimes in subtle ways, as with the various place names taken from the men who gave money for the university’s founding. Will changing the names of places on campus help achieve that goal? Register’s team is not yet ready to make recommendations, though there is a broad spectrum of options available, from changing names and moving monuments to creating digital resources that provide deeper historical context for landmarks that evoke an earlier era. “The most important thing first is that we make this history known and not make the argument that, that was long ago and it doesn’t matter,” Register said. “It does matter, and it should matter to us today. The spring in Silver Spring, MD is singular. The town was named for ONE spring. Thanks for the catch, Peggy, and the history lesson. We’ve fixed that spelling. Thank you for another great article by David Paulsen! I’m eager to see how we as a church grow and are transformed as we develop a shared and historically accurate understanding about how some benefited from slavery, others resisted slavery, and many were brutalized in ways that continue to harm individuals, families, communities, and our nation today. I wonder what our Episcopal independent schools would learn about their founders and histories were they to embark on similar journeys? I’m greatful Sewanee is undertaking this project. I was christened in the Church of England. My mother chose not to worship as Anglican due to racism. When I moved to America as a young girl, I grew up in a different religion. I have since returned. America has the grave sin of slavery in its history. If we don’t talk about it, we will get nowhere. As a black woman, I am torn between having institutions tear down symbols or leave them up for historical value and discussion. I look forward to what The Episcopal Church is doing. It is clear to me that all of this is being approached in a thoughtful, scholarly, sound manner. It is vital for us to be honest about our past, both with ourselves and with others. Sewanee is a distinguished institution of higher learning, with a national reputation that we want to maintain. The seminary has historically been, and I think continues to be, the nurturing place of important clergy leaders of the Episcopal Church — people who have made a great difference in our quest for justice and grace in the country, in the name of Jesus Christ and HIs Good News. It may be that some of the symbols on campus should be removed or changed and that others may remain, with a recast narrative to explain them and conscientiously celebrate their meaning to the university for good. This project is in good hands, and all of us should support it. Descendants of slavers, and of Sewanee alum who celebrated that tradition, should indeed repent, seek to atone, seek to repair in behalf of our ancestors and to make amends for pride and privileges derived from slavery. The depth and perpetuation of our racism is manifested when whites presume to choreography reconciliation. I recommend dropping that term from the project. Sons and daughters of Sewanee alums are not the ANC. P S my dad, Sam Madison Powell loved Sewanee. He went to the academy and the college. The former presiding bishop, David Rose, who went on to seminary, was his classmate and good friend. role and involvement with slavery, racism and discrimination. I look forward to the new scholarship and changes Sewanee will make to reconcile our Episcopal past with our goal to cleanse our soul as an institution for the 21st Century. Thank you for presenting this work. As a former long time EFM mentor (and graduate), Sewanee holds a special place in mhy heart. We need to be doing this in every corner of tne church.